For early learning, this is truly a new baby essentials gift set! 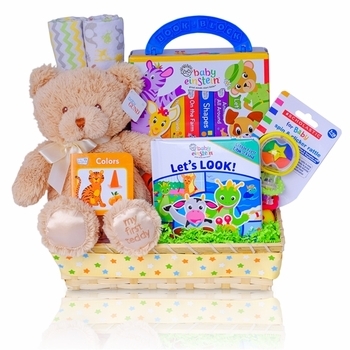 With this adorable gift basket, baby can snuggle with their first teddy bear while reading along with mommy or daddy! With a satin foot embroidered with (�My First Teddy�), this is a genuine plush teddy bear made by Gund, one of the oldest manufacturers of soft toys in the USA! For reading, we include some fabulous board books by Baby Einstein, renowned for award winning educational toys and books. Inside you�ll find a 12 book mini book library to help babies learn colors, shapes, numbers and much more as well as a larger book titled (Let�s Look!) which stimulates the child with looking for and finding things on each page. To complete this gift, we also add 2 super soft flannel receiving blankets for even more snuggling and a spin and clicker baby rattle by Scholastic. The entire collection comes in a natural woven basket decorated with colored ribbons and wrapped in clear organza for a lovely display!